If you use the delightful Electoral Calculus to ‘predict’ the 2015 UK general election result using the latest opinion-poll figures from ComRes, there’s very little variation whether you use the First Past the Post (FPTP) or Alternative Vote (AV) electoral systems. According to ComRes, the current voting intentions across the UK would be Labour 40%, Conservative 36% and Lib Dem 10%. Using FPTP without factoring in any tactical-voting swings between the parties, and on the basis of existing constituencies, Labour gains an overall majority of 40 while the Lib Dems drop to only 14 seats. Using AV still gives Labour a majority of 30 but helps the Lib Dems to 32 seats: much better, but still way below the 65 seats that would be proportional to their vote share. Factoring in a 5% tactical-voting swing from the Conservatives to the Lib Dems doesn’t change the result. However, Electoral Calculus doesn’t allow you to factor in a tactical-voting swing from the Lib Dems to the Tories. On the basis of the Electoral Calculus prediction – however unreliable it may be – I would say that the best thing Lib Dem voters could do to prevent an outright Labour win would be to give their second preferences to the Tory candidates wherever they stand a chance of beating Labour. This runs slightly contrary to my previous post on AV tactical voting, where I assumed that Lib Dem voters would be reluctant to give their second preferences to the Conservatives in seats of this sort in the context of a Labour resurgence. However, if the aim is to prevent an overall Labour majority, this makes absolute sense – just as it makes sense for Conservative voters to indicate the Lib Dem candidate as a higher preference than the Tory candidate in seats of this sort in order to defeat Labour, on the basis that Lib Dem voters couldn’t be trusted to give the Tories enough second preferences to win. Obviously, if it emerged during the campaign that doing so would be the best means for the Lib Dems to keep out Labour, then the tactical rationale would change. Ironically, if Labour were thwarted from winning an overall majority by this tactic, then the Lib Dems would be in a much better position to form a coalition with Labour as the largest party. The same tactic would apply under FPTP, except that Lib Dem voters would have only one sensible choice: the Tories. In other words, if Lib Dem voters in Tory-Labour swing seats want a coalition with Labour, they’d be better off voting Tory as their only choice under FPTP, and as their second preference under AV, rather than voting Labour! Such is the bonkers logic of single member-constituency parliaments elected by either system! If you enter more realistic predictions of the parties’ vote shares in 2015, you get a hung parliament under either system, the only difference being the number of Lib Dem seats. I would consider a 35% share of the vote for both Labour and the Tories to be more realistic, with the Lib Dems recovering to 20%. On this basis, Labour emerges as the largest party under both systems, with the Lib Dems gaining 45 seats under FPTP and 65 under AV. If you enter lower vote shares for the major parties – on the basis that AV is supposed to encourage voters to opt for minor parties as their first preference – there’s virtually no change to this picture. Assuming a 32% share of first preferences for both Labour and the Tories, and 16% for the Lib Dems, Labour is still the largest party and the Lib Dems win 63 seats. Minor parties pick up only one seat, and that’s not Caroline Lucas for the Greens in Brighton Pavilion, who is predicted to lose her seat to Labour. So much for AV fostering political pluralism! The Australian elections are heading towards an almost perfect tie. At the time of writing, the governing Labor party had won 70 seats, with the opposition Liberal-National Coalition gaining 72, while independents had won four seats and the Greens one. This meant that, with three seats still outstanding, no party would cross the threshold of overall control (76 seats) and a coalition deal would have to be struck between one of the larger parties, the independents and potentially the Greens. The results in terms of seats belie the fact that the Coalition had obtained 43.5% of ‘primary votes’, compared with 38.6% for Labour and 11.4% for the Greens. So based on vote share alone, the Coalition [capital c] ought to be entitled to try to form a coalition [small c]. ‘Primary votes’ are what we’d call over here ‘ first-preference votes’: Australia uses essentially the same preferential voting system that we’re going to have the option of adopting in the referendum next May, and which is known in the UK as the Alternative Vote (AV). The only difference is that, in Australia, voters are obliged to express a ranked preference for all the candidates in the election; whereas, in the UK, voters will be allowed to rank only the candidates they actually want to vote for. In my view, the Australian results demonstrate once again just how bad a system AV is and how it favours two-party politics, or two-and-a-half-party politics as it would be in the UK. This is because people’s higher-preference votes for smaller parties inevitably end up being eliminated in the counting process, and only those voters’ lower-preference votes for the major parties are ultimately used to determine the result. This tendency is exaggerated even further in Australia by the fact that you are obliged to exhaust the ballot (express a preference for all the candidates), so that almost every vote comes down to a contest between the two largest parties. Also, the fact that the Greens achieved their best-ever result, and yet their 11.4% of votes translated into only one seat, shows how unfair and disproportional the system is. What essentially happened in this election is that first-preference votes for the Greens were transferred almost entirely to the Labor Party in the preference count, which frequently enabled the Labor Party to overtake the Coalition, which had obtained more primary votes than Labor in many seats. This is how Labor managed to almost achieve parity with the Coalition on seats despite its much lower share of primary votes. In the UK, this mechanism is likely to favour the Tories and the Lib Dems at the expense of Labour. In Tory-Labour fights – in England, this is mainly in the Midlands and the North – it’s quite conceivable that more Lib Dem voters would put down the Tories as their second preference rather than Labour, especially if those two parties are still in a coalition. So if Labour is only narrowly ahead of the Conservatives on first-preference votes, it’s quite possible the Tories could leap-frog Labour to victory thanks to the Lib Dem second preferences. As a consequence of this threat, I’ve suggested elsewhere that Labour voters in close Tory-Labour elections held using AV should consider voting tactically and putting the Lib Dems down as their first choice, in order to ensure that the final two parties left in the count are the Conservatives and the Lib Dems, and so enable the Lib Dems to beat the Tories based on the second preferences of Labour voters. This example demonstrates how, despite what is claimed for it, AV actually encourages some rather perverse tactical-voting scenarios. Meanwhile, in Tory-Lib Dem fights – e.g. in southern England – the Lib Dems are more likely to benefit from this mechanism as Labour voters’ second or final preferences would be expected to be for the Lib Dems, if anything, rather than the Tories. Now, you could say that this aspect of AV is actually fairer than allowing the election to be decided purely on the highest plurality (i.e. based on the largest minority of ‘first preferences’ only, which is effectively what First Past the Post does in most seats). But if more people genuinely want one party to win rather than any other, isn’t that a fairer result, even if it produces disproportional outcomes at a national level? AV is arguably better at producing the ‘Condorcet winner’ (the candidate that would be preferred by most voters overall to any other candidate in a straight one-to-one comparison) but not so good at indicating the candidate that is strongly preferred by the greatest number, which FPTP in theory does better – although FPTP results are distorted by tactical voting. These problems do not exist in either of the ARV or TMPR voting systems discussed in previous posts: ARV always awards the win to the most popular candidate overall, regardless of whether this is the Condorcet winner or not; and TMPR gives the seats to both the Condorcet winner and the party that is strongly preferred by most voters – or both to one party, if they are the same. Be that as it may, as in Australia, we’d effectively end up with two-party politics in England using AV, except the two parties in the North and Midlands would be the Tories and Labour (unless tactical voting for the Lib Dems by Labour voters of the kind I suggested above kicked in), and the two parties in southern England would be the Tories and the Lib Dems. This would effectively consolidate the three parties’ stranglehold over English politics while squeezing out the smaller parties. The only way parties like the Greens and UKIP could win seats would be if there was a strong candidate from one of those parties that supporters of the other parties would vote for tactically, whether as their first or subsequent preference, in order to unseat the incumbent MP. This is in fact what happened in the Australian seat of Melbourne, won by the Greens yesterday, as first-preference supporters of the Coalition – with its notoriously hardline anti-Green leader – hypocritically transferred their subsequent preferences to the Greens in order to defeat the Labor candidate, who came top in terms of primary votes. This shows just how pernicious tactical voting can be under AV: the Greens benefiting from Coalition tactical votes designed to beat Labor, whereas normally Green voters transfer their vote to Labor. So don’t believe it when people try to claim that AV eliminates tactical voting: far from it. Nor is it remotely proportional and, arguably, fair in terms of awarding the win to the most popular candidate in each constituency. You could argue that the overall result in Australia, in terms of seats, is proportional to the extent that, in most seats, it came down to a straight fight between the main left-of-centre and right-of-centre candidates, and that these two fundamental positions were evenly matched overall. But this does consolidate the dominance of only one left-of-centre and one right-of-centre party – or, in England, two left-of-centre parties and one right-of-centre party. And, on top of which, AV would perpetuate the electoral divisions between the different English ‘regions’, making Labour only a party of the Midlands and North, and the Lib Dems only a party of the South; while the Tories are the only real right-of-centre alternative nationwide. No wonder the Tories were so keen to put AV, and not PR, into the coalition agreement! And perhaps there was some cynical calculation on the part of the Lib Dems to the effect that permanent three-party politics, which is the most likely consequence of AV, would at least assure they had a quasi-perpetual influence over Westminster’s unaccountable governance of England. It must have been an interesting night in the Clegg household last night! The half-Dutch deputy PM watching the World Cup final with his Spanish wife, and kids with doubtless split loyalties! But as could have been predicted – and, indeed, as was predicted by that noted oracle, Paul the Octopus – the blues got the better of the orange. The blues were indeed far more deft in their manoeuvres, and far better on the ball, than the oranges, who were left hypocritically crying foul! And when the reckoning came, the blues were the dominant force and the oranges were roundly defeated. I’ve just been listening to an interview with SNP leader Alex Salmond on BBC Radio 4’s PM programme. Towards the end of the interview, Eddie Mayer asked Salmond if the SNP would be prepared to break the self-denying ordinance it has hitherto observed in parliamentary votes on what Mayer called ‘devolved’ matters and what Salmond rightly insisted on calling ‘English-only matters’. The context of the question was the SNP’s election-campaign claims that they would use their influence in a hung parliament to defend Scotland’s interests, in particular to shield Scotland from the severity of the budget cuts that those of us living south of the border are going to have to endure. How could they exercise that influence if they refused to support the party of government in England-only votes? Salmond stated that he wanted to keep the option of voting on English matters ‘up his sleeve’ as one of the trump cards he might need to play to secure the SNP’s objectives. In other words, the SNP would be prepared to vote on English matters in some circumstances. Mayer then set the example of a minority Conservative government needing the SNP’s support in a vote on an (English) education bill. Salmond suggested that the example was unrealistic, as the SNP would be more likely to support a more ‘progressive’ policy agenda than one of Tory cuts to public services. This is a round-about way of saying that the SNP would prop up only a Labour minority government or Lab-LibDem coalition, not a Tory government or, one assumes, a possible Con-LibDem partnership. In other words, if Gordon Brown wants to cling on to power after the election – whether Labour wins the largest or second-largest number of seats – his best bet might be to forge a deal with his SNP compatriots and, of course, Labour’s Plaid Cymru Welsh-Assembly coalition partners. Come to think of it, it’s rather obvious that Salmond could not get away with suggesting he might do a deal with the Conservatives at Westminster, as the SNP has tried to position the Tories as an anti-progressive force intent on savaging Scottish public services. Salmond is therefore indirectly encouraging Scottish voters to vote Labour in seats where the SNP can’t win in order to ensure a sufficiently large ‘Scottish block’ of ‘progressive’ votes in the new parliament that can override the Tory-LibDem majority in England. The West Lothian Question could be more alive and embittered than ever in the new parliament – which of course also suits Mr Salmond’s agenda just fine. Vote for England and St. George? That’ll teach them not to officially fly the flag of St. George atop our dual-purpose English and British parliament! 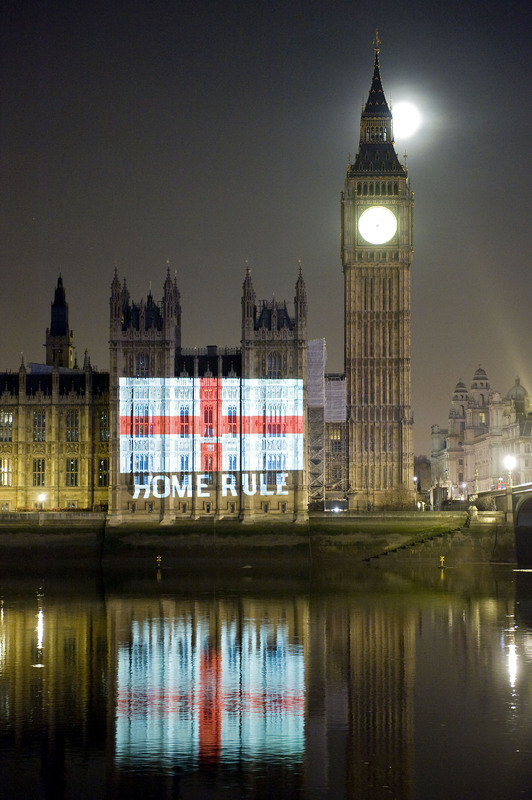 Serves them right – although, apparently, the police stopped the Power 2010 activists from projecting this giant Cross of St. George onto the Palace of Westminster after only about two minutes, no doubt on some spurious counter-terrorist or public-order grounds. British police state! The Power 2010 campaign, which was, to say the least, a reluctant convert to the cause of English votes on English laws at the time of their online poll to determine the most popular ideas for constitutional reform, which culminated in February, is now urging people to write to their parliamentary candidates to ask them for their views on the English Question. Good for them, and great idea to project the flag and create this image! There’s no doubt that if all English people who support an English parliament – 68% according to an ICM poll commissioned by Power 2010, due to be published today – could back just one party in support of that aim, then that party would romp to victory at the general election and reclaim Westminster as the English parliament. But in practice, the idea of voting for a pro-EP candidate puts me in something of a quandary. I devoted my last post here to promoting the idea behind the Hang ‘Em campaign, which seeks to mobilise voters to back the candidate most likely to advance the cause of a reforming parliament, principally by achieving a hung parliament. In accordance with that objective, I’ve decided to vote Lib Dem, as their candidate in my constituency is the only one who could possibly defeat the existing Tory MP, thereby furthering the goal of a hung parliament. But should I switch my vote over to the Tory if he turns out to support an English parliament? I’m definitely going to take the opportunity to ask him and should have done so when I bumped into him in a local street canvassing last week (! ); but I’m not sure he or one of his campaign team are going to have time to reply before 6 May now – talk of doing too little, too late, myself included in the criticism! In any case, I think it’s highly unlikely he would support such a radical constitutional innovation, as he never seems to deviate in any way from official Conservative policy, which doesn’t even propose a workable solution to the West Lothian Question, let alone address the English Question. But what if he does turn out to support an EP? Well, there’s no point voting for a candidate who favours an English parliament who, if elected, wouldn’t do anything to advance that cause. But I’ll ask him whether he would do anything about it, if he does support an EP, and give him the chance to set out his views. I’ll let you know what answer I get to my question, if any. But my default position remains that the best way to promote the goal of an English parliament is to vote for a hung British parliament; and, in any case, voting Lib Dem is entirely consistent with both objectives, as they at least say in their manifesto that the English Question needs to be dealt with as part of an overall British constitutional convention. So I still say ‘vote hung parliament’ until the Cross of St. George hangs from an English parliament!